Nanette Lepore Capri Gingham Goddess One Piece. COLOR: Azul. - Allover gingham print. - Button strip on front. Shell: 42% nylon, 47% polyester, 11% elastane. - Seam detailing throughout. Lining: 84% nylon, 16% elastane. Bikini bottom in allover mixed patterns featuring shirred sides and cheeky-fit seat. Hand wash cold. 83% poly, 17% elastane. Label: Nanette Lepore. Color: Multi. 87% nylon / 13% elastane. Voyage to a secluded, hidden beach and swim jewel-tone waters in the dramatic Capri Gingham Goddess High Leg One-Piece swimsuit. Solid one-piece swimsuit features playful gingham pattern and button detailing. It's the "Pretty Tough" cover-up in Ruby. Details below. 23" across chest from armpit to armpit. length from shoulder = 34". 100% polyester. Style: Bikini Top. Type: Woman Clothing. Pet and smoke free. FABRIC CONTENT - Body: 83% Polyester 17% Elastane Lining: 87% Nylon 13% Elastane. SIZE - Large. Allover floral embossed jacquard. Triple ladder stretch trim. Heighten your swimwear collection with this swim top that exudes contemporary inspiration. Nanette Lepore. Jade Jacquard High Neck Bikini Set. Size Large. Full Coverage. Fully Lined. LOUNGE WEAR. SWIM COVER-UP. SIDE SPLIT LEG. BEACH WEAR. FLOWY WIDE PANTS. FRONT RISE: 10.5". BACK RISE: 13"-13.5". WAIST: 15". 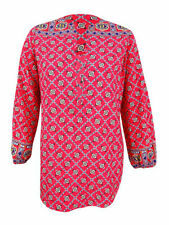 Nanette Lepore tunic in tile print. Inverted center back pleat. Pullover style. Nanette Lepore Mosaic Bikini Bottom. Embroidered sides.